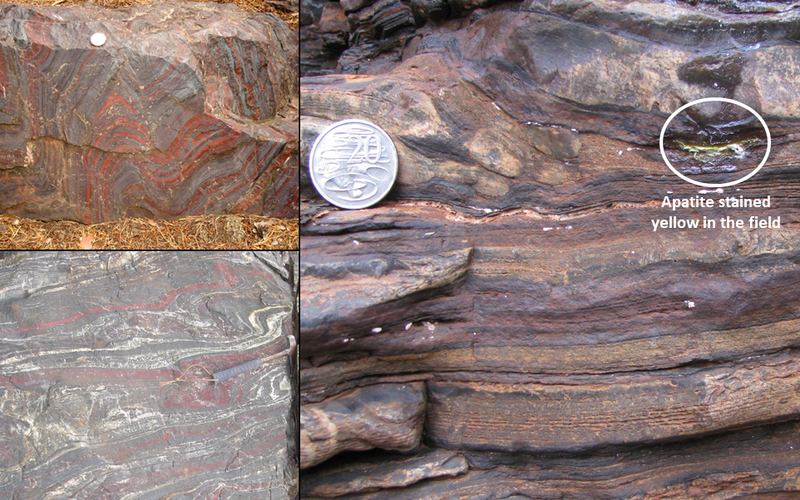 Rocks with banded iron formations and biosignatures - 1,900 million years old, Michigan, US (top left), 2,700 million years old, Ontario, Canada (bottom left) and 2,500 million years old, Karijini National Park, Western Australia (right). Credit: Dr Dominic Papineau, UCL. The research, published in two papers – one in the Journal of the Geological Society and another in Earth and Planetary Science Letters – solves the longstanding problem of how scientists can track records of life on Earth in highly metamorphosed rocks more than 3,700 million years old, with organic material often turning into the carbon-based mineral graphite. They argue that carbon preserved in graphite-like crystals –‘graphitic carbon’– located alongside minerals such as apatite, which our teeth and bones are made of, and carbonate, are the biosignatures of the oldest life forms on Earth. “Life on Earth is all carbon-based and over time, it decomposes into different substances, such as carbonate, apatite and oil. These become trapped in layers of sedimentary rock and eventually the oil becomes graphite during subsequent metamorphism in the crust,” explained Dr Dominic Papineau (UCL Earth Sciences, Centre for Planetary Sciences at UCL/Birkbeck and the London Centre for Nanotechnology). Fossil biomass preserved as graphitic carbon in a late Paleoproterozoic banded iron formation metamorphosed at more than 550°C. Widespread occurrences of variably crystalline 13C-depleted graphitic carbon in banded iron formations.